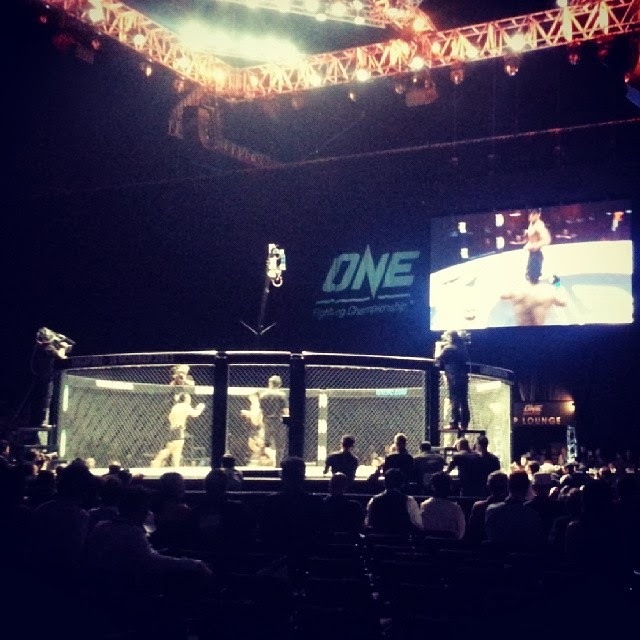 Friday, 18th Oct 2013 was the first time I’ve ever been to a live fight championship! Thanks to a good girlfriend Abigail, who is apparently taking up BJJ (Brazilian Jujitsu) and her gymmate snagged some seats for us. I’ve only watched WWF (previously known as) and Fight Club etc onscreen movies, atleast that was it for me for professional matches. Initially it was pretty hilarious as we were supposed to be on the sidelines of the entrance walkway of these fighters into the arena to cheer them on and reach out for the Hi-5 etc. After the warmer-up 3x rounds (which were all won by our locals and one of them being Abigail & Co.’s buddy – GO SINGAPORE!!!!! ), we went for a toilet break and never returned to that specific location. Alot of jargons, all not that alien cause some of my friends do talk my ears off about these and a series of human battles. The sounds of skin hitting skin, the crowds shouting/boo-ing/cheering on their favourite contenders, THAT hyper alert voice of the announcer, not-so-hot Ring Girls (according to Gail), a good ice-cold beer (A, one only k) and some popcorns made the night interesting to be in and part of. The reigning Champion from last year is only 21 and someone behind us comment “If in Singapore, need to serve NS!” which rendered a couple of snickers from us. Abigail’s pal Juan Wen Jie won the Catchweight round, wee! Alot of the fights were interesting and kept us on the edge! The initial 2 matches had clearcut winners but subsequently it was all about technics and things-i-can’t-remember-at-2.50am. How Shannon knocked out Mitch in the Featherweight challenge was awe-inspiring, how Sylvain turned the table of Jake in the light heavy weight round and flexed his puppies when he won was just showmanship. The Middle Weight and Featherweight rounds were the best! The contenders were in an all-out battle against each other but charmingly had respect for their opponents (although Japan’s Aoki got hit in the groin). We left during the first round of the final match, pretty much all of us were yawning or running on reserve energy. Couldn’t help but notice how when western was pit against Asians, the Asians gladly walked away with the win… hmm!! YAY! Of course being around all those toned people – NEED TO GO GYM! !